1. Electronic Oven Control with Kitchen Timer. models) or Dual Element Control (some models). 4. Warming Drawer Control (some models). 5. Warming Drawer Indicator Light (some models). 6. Warming Zone Element Control (some models). 7. Warming Zone Indicator Light (some models). 8. Warming Zone HOT SURFACE Indicator Light (some models). 10. Right Front Dual Element Control & Digital Display. 11. Oven Interior Light with removable Cover. 12. Automatic Oven Door Light Switch (some models). 15. Convection Fan & Cover. 16. Adjustable Interior Oven Rack(s). 17. Large 1 piece Oven Door Handle (styles & colors vary). 18. Full width Oven Door with Window (styles & colors vary). Warming Drawer with Handle (some models). 20. Easy to clean upswept Cooktop. 21. Ceramic Smoothtop (elements, styles & color will vary). 23. Bridge Element (some models). vary according to model type & color. 27. Right Front Single or Dual Element. 28. 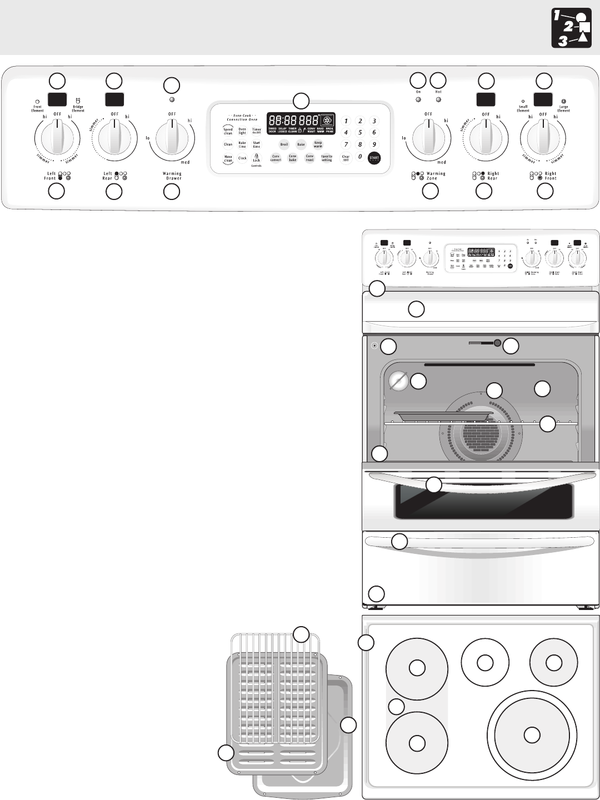 Broil Pan (some models). 29. Broil Pan Insert (some models). 30. Roasting Rack (some models).